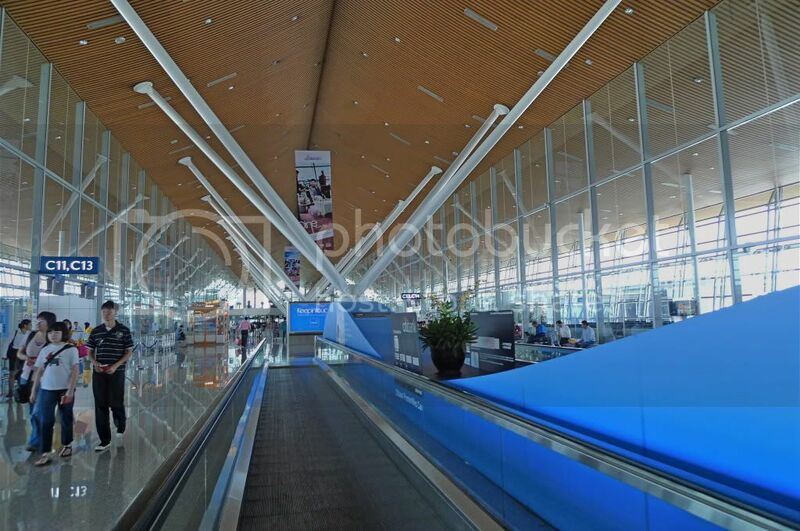 I know some of you are waiting to read about my Bangkok trip, but I just need to blog a little about KLIA first. 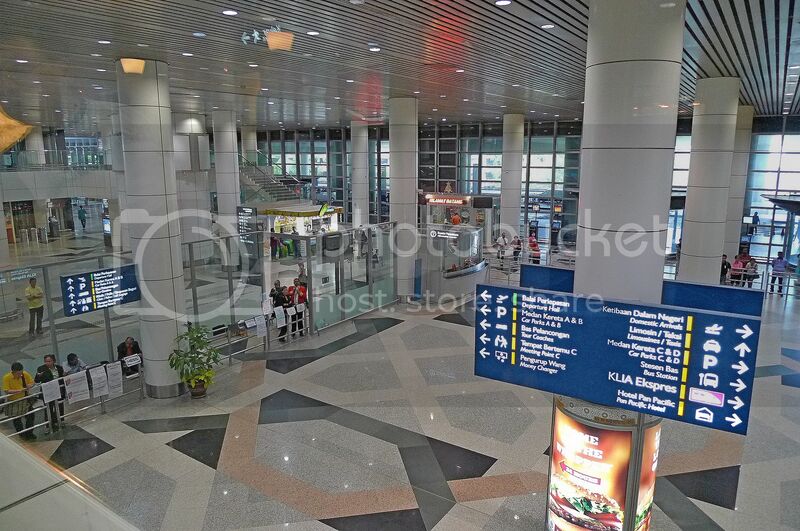 You see, most of the time I fly with AirAsia and therefore I usually go to LCCT and not KLIA. This time I flew with Thai Airways so I had to go to KLIA. If you have read my previous post, you would know that I took the KLIA Ekspres from KL Sentral. 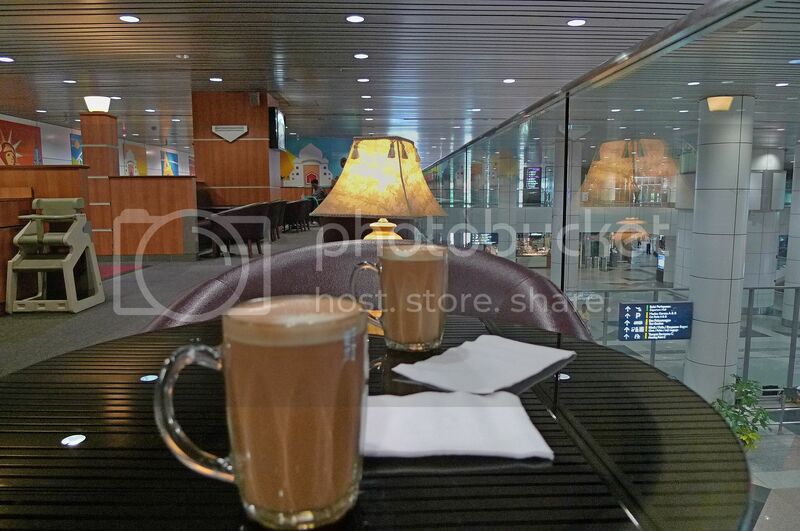 It was still early when my friend and I reached KLIA so we went to have our breakfast. 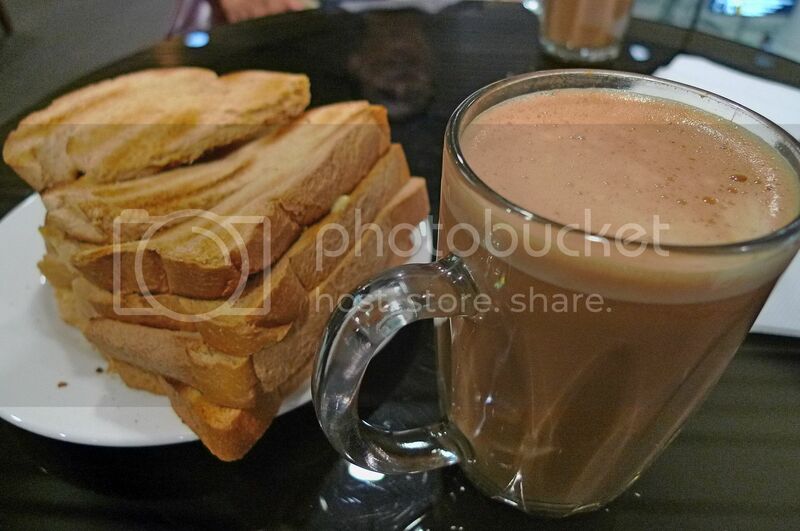 We had the usual coffee and toasted bread with butter and kaya. I did not like the way they made the toasted bread but since we would be having meals on the plane, I did not bother about it too much. After breakfast, we went to check in our luggage and since there was still a lot of time, we walked around the Main Terminal of the airport. This is near the place where I took pictures of the numerous plane models which I blogged about in a previous post. 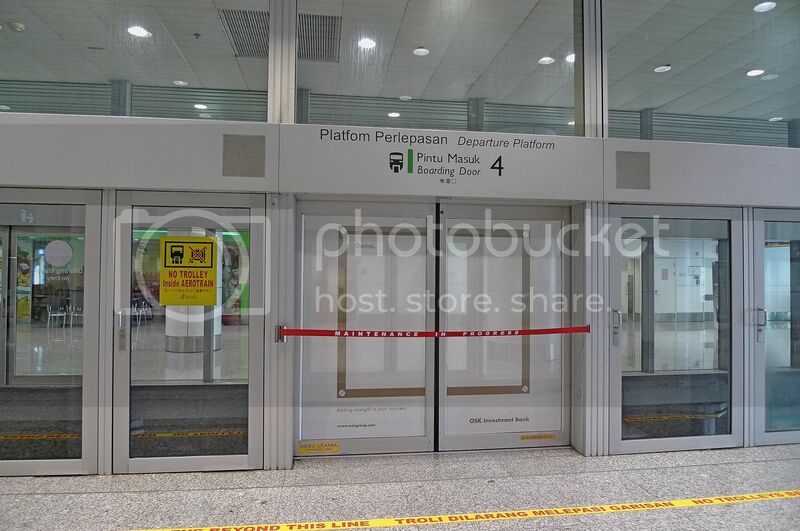 We found out that the Aerotrain service which transport passengers from the Main Terminal building to the Satellite building and back, was closed for maintenance and modification work. It would remain closed until March 15 next year. During this shutdown period, shuttle buses were provided as alternative. We went up a shuttle bus. We reached the Satellite building in about 10 minutes which was of course slower than the 4 minutes it would have taken us if we were to use the Aerotrain. We still had a lot of time in our hands so we walked around the Satellite building. 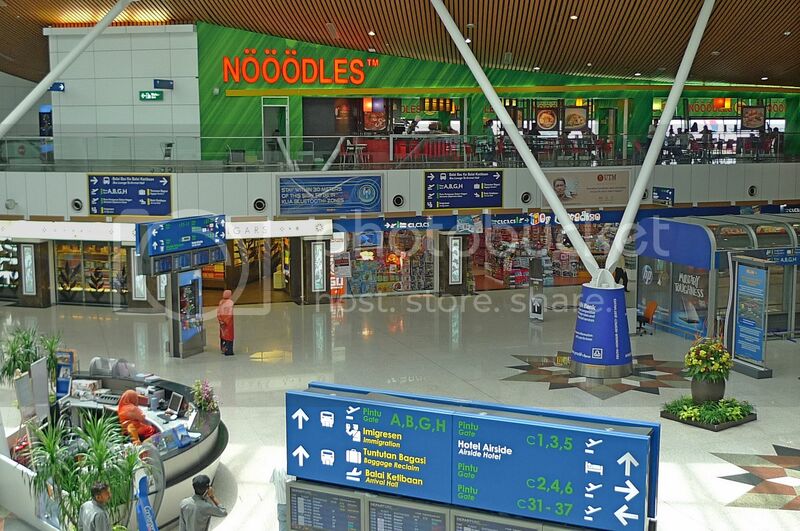 There were many shops in KLIA. One of them is Harrods. Stepping into Harrods, I saw this! I spotted this restaurant and couldn't help thinking how easy it was to create a name for a restaurant by simply inserting an extra "O" to the word "NOODLES"! 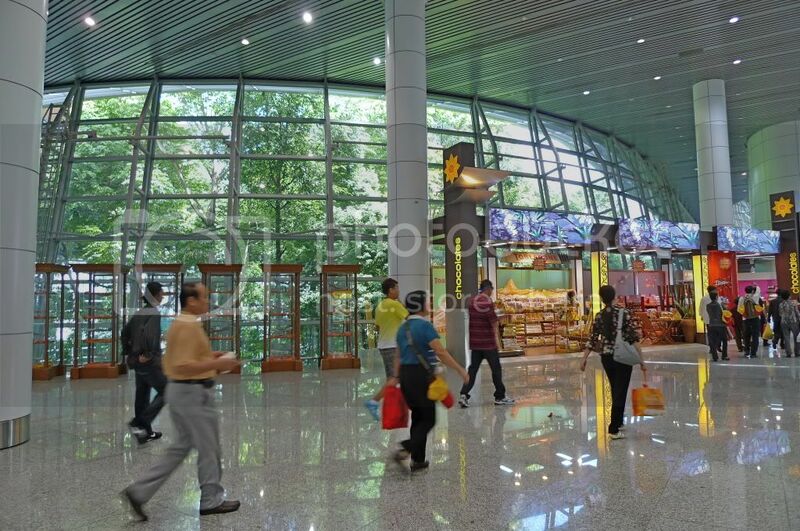 KLIA is known as an airport in the forest. 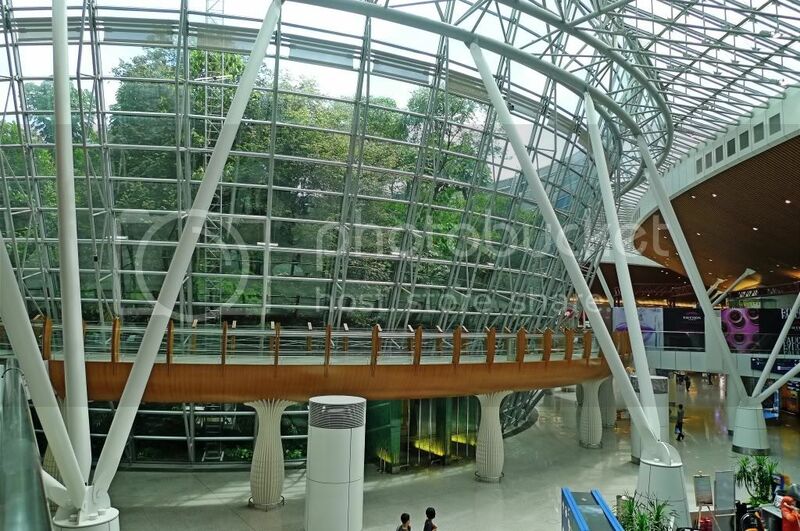 It was in fact designed with the concept of "an airport in the forest" and "forest in the airport". 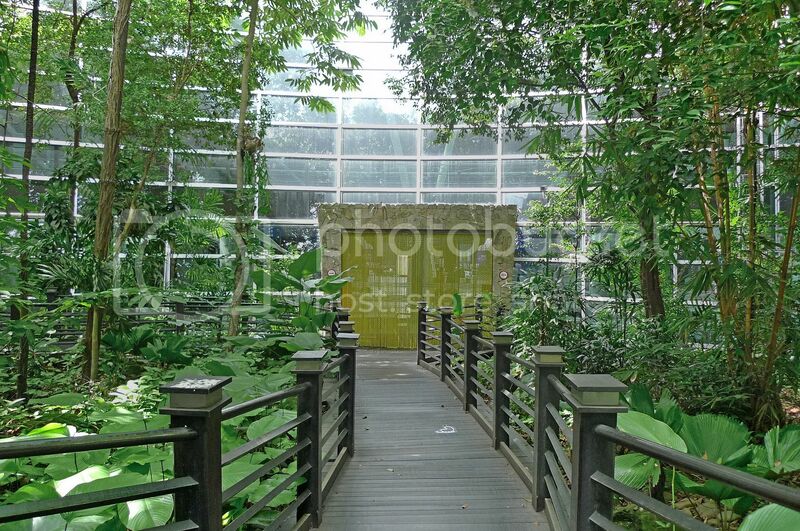 I have heard that you can visit the forest in KLIA but I never had the chance to do that. 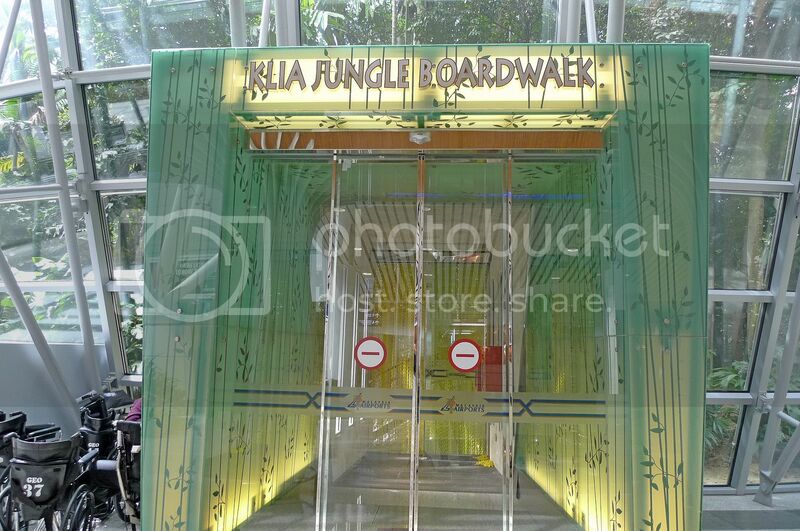 So when my friend introduced me to this KLIA Jungle Boardwalk, I was delighted! I wonder why they use the word "Boardwalk". Kind of reminds me of the Monopoly board game! Haha! The entrance to the Jungle Boardwalk was quite unique. Once we got past that, we found ourselves in the jungle, sort of! Lush greeneries and tall trees surrounded us. 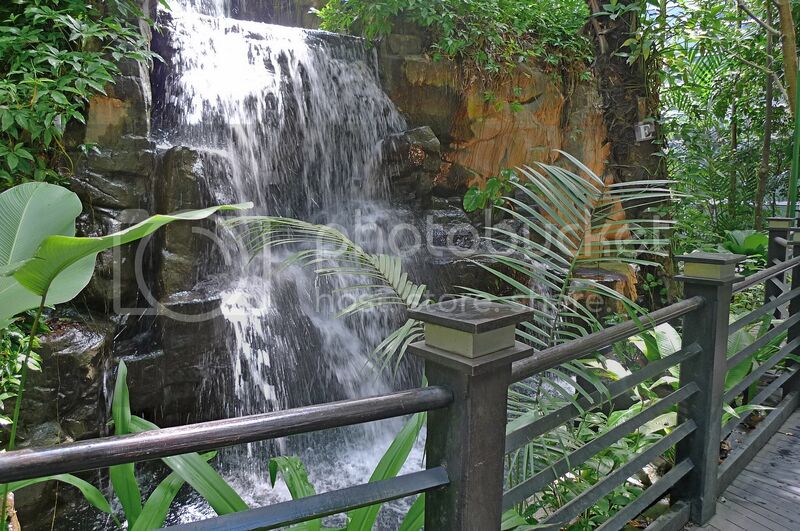 And of course, the jungle would be incomplete without a waterfall. We took some time to enjoy the waterfall and snap some pictures. This is the view of the entrance we came in earlier from where I stood near the waterfall. After walking through the jungle, we reached the exit on the other side and walked out. 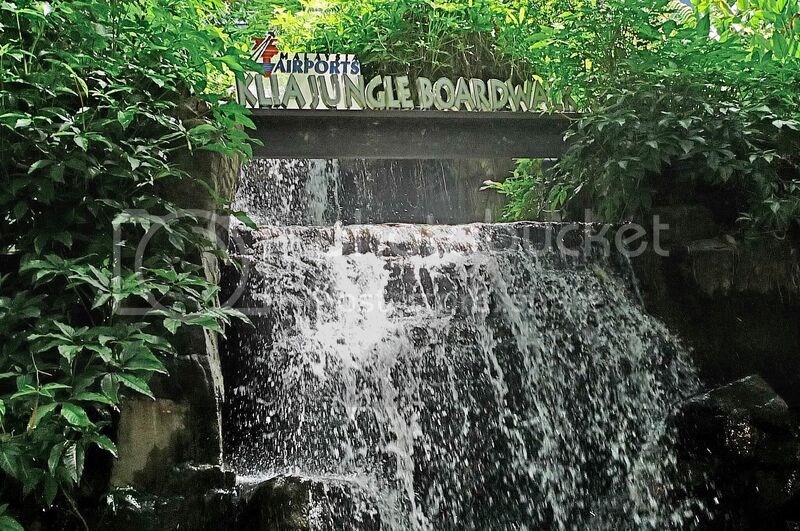 This is the view of the exit from outside the jungle. Soon it was time to board the plane. I took a few more pictures as we walked to the departure hall. Below is the Aerotrain tracks currently closed for maintenance. Would you rather walk or stand on the moving platform? Having traveled most of the time with budget airline AirAsia, I was looking forward to fly with Thai Airways! OMG! OMG! OMG! I'm first???!! The "forest" sure looks nice. I have to go and check out it out one day! I must say...this has gotta be one of the main attraction there huh! :D With lust with all those greeneries. Hoe about the air? Very fresh? Is there any koi? nice eh...I like the jungle boardwalk! Interesting! morning panda! :D aiya!! mmg waiting for ur bangkok trip post!! haha the nooodles only selling noodles?? wat a name. eih? 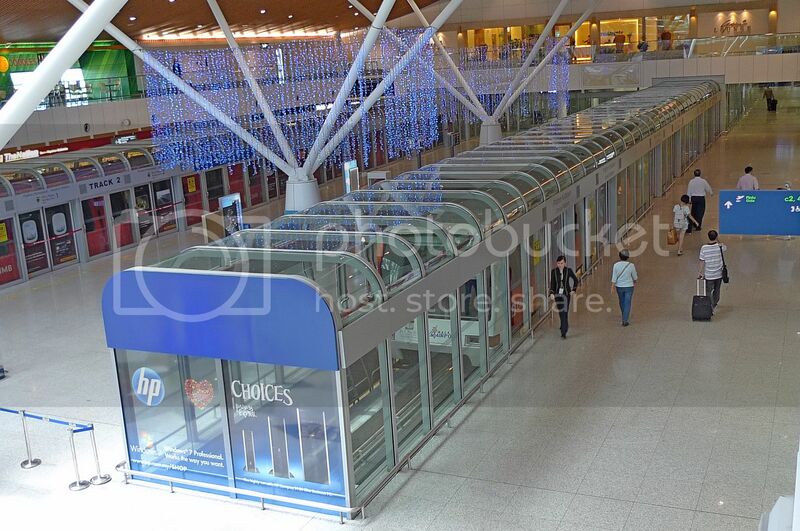 forest in the airport? no wonder got jungle boardwalk! nice! 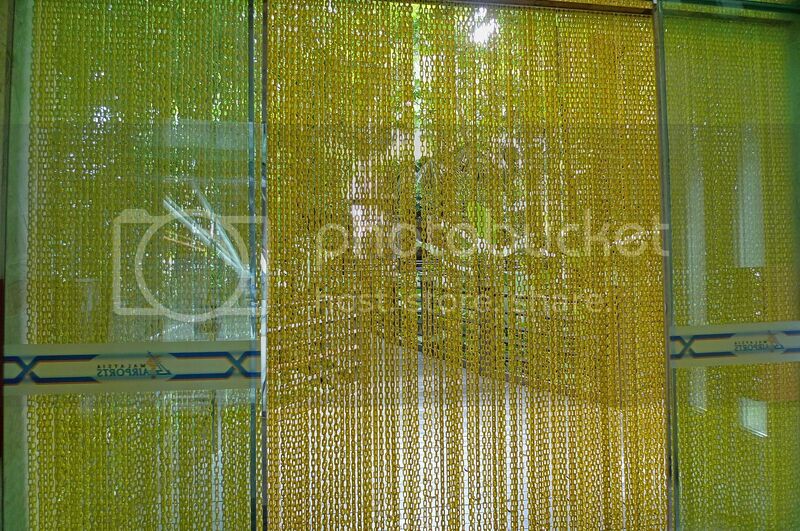 hey..i dint know there is such a nice jungle place to enjoy the greenery.. normally just visit the shops.. window visiting only! What a horrible way to start off the trip with a broken aerotrain. You were lucky they supplied a shuttle the walk can be quit long. Firefly will fly from KLIA to East Malaysia soon. Hopefully this will help to revitalize the airport. Panda exposed in KLIA!!!!!!!!!!! LoL! the jungle is just a nice brief one..I like to walk on the moving platform. I passed the forest in the airport but didn't bother to check it out. I had to get breakfast before heading for my flight. ooh, this is nice!!! 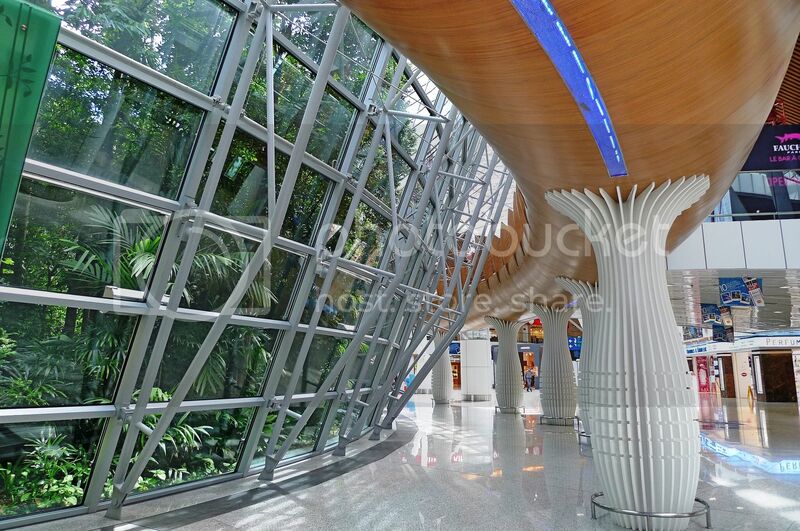 i think this jungle broadwalk must be new.. i've not seen that before..
i remember we can only see the "jungle" from inside the departure hall, but didn't know we can walk in now..
i'm flying to Hanoi next week with MH, hmmm, i think i'll go in and have a look if i've got the time..
i always like this kind of jungle/forest/garden in a building, feel so lively and so refresh..
Wow, its a beautiful place! (Picture number 6) Is that the stewardess? I must say I enjoy you photos more and more! i haven't been to the Jungle boardwalk. it must be a fascinating spot to explore. will check it out someday. i choose to walk if there are way too many people standing on the moving platform. It looks so clean and so world-class. The boardwalk is refreshing for those who are on transit and looking for some greenery. 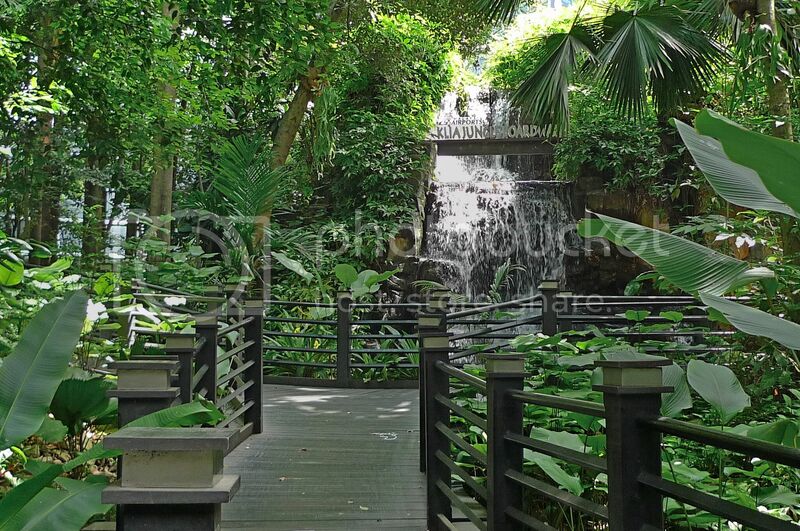 I saw the jungle boardwalk too but of course didn't have time to explore, thanks for sharing the pics! 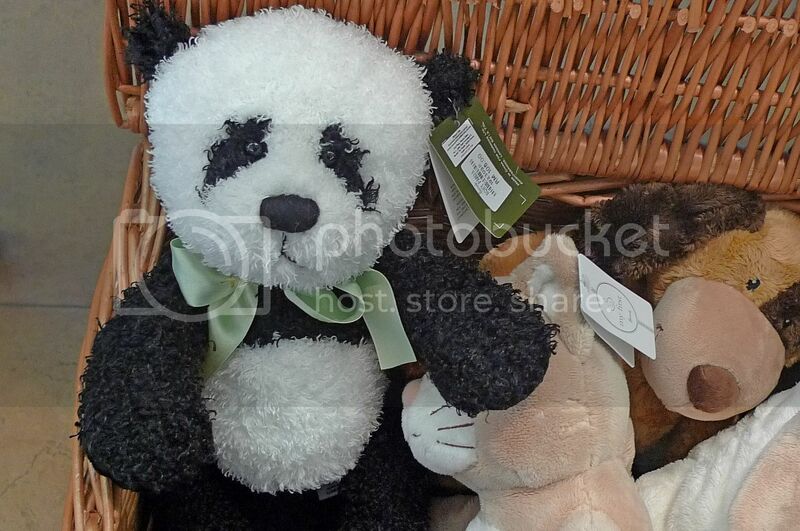 So cute the Panda bear but yeah >RM100 not worth it! so that is a man-made water falls??? really... an airpot in the forest.. very interesting... and it is noce to know that they still reserve the environment despite of the major construction done to build this airport right? 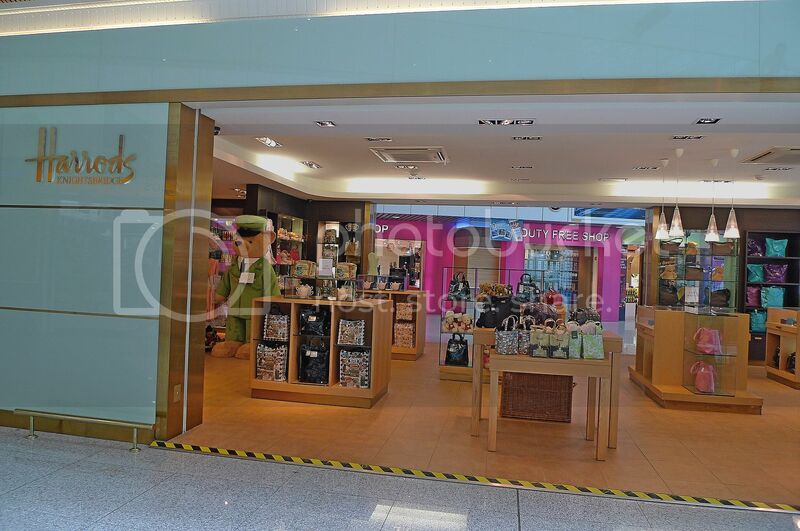 Can't believe that there's actually such a place in KLIA. guess there will be a long queue at peak flight times. didn't know there was a "jungle" out there. It is a lovely place. The phrase that best explain the place is "Heaven on Earth". Coming to the food, I love this type of crispy biscuits and with tea or coffee. 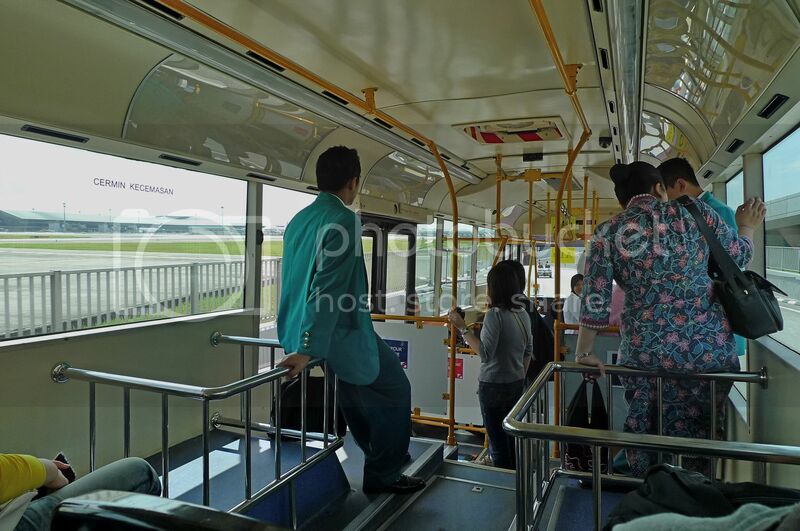 tekkaus, well it's all paid for so patriotic or not, I have to board Thai Airways! Haha! The toasted bread did not taste nice. The coffee was OK however. 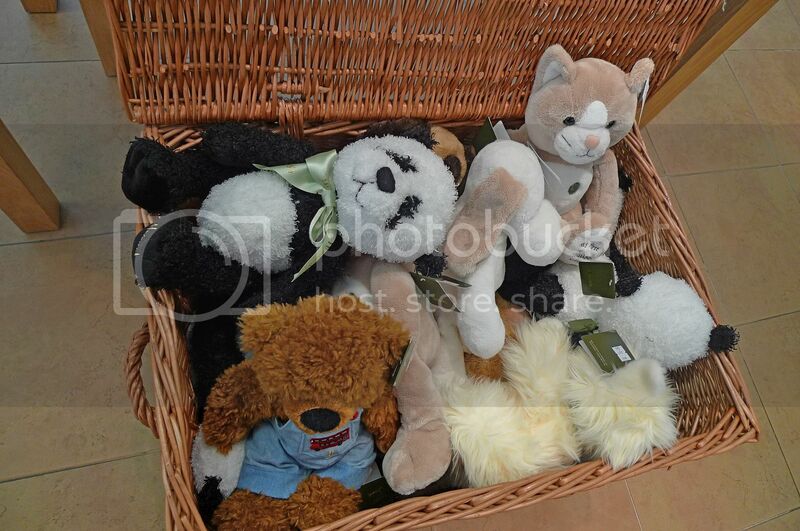 Yes, the panda costs over RM100, it's from Harrods so surely expensive and definitely not worth buying in my opinion. Haha! 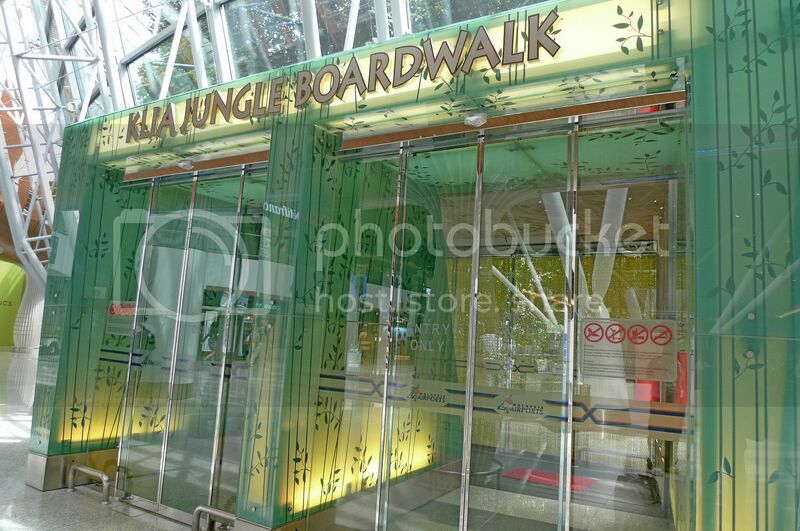 angelinebk, have you been at the Jungle Boardwalk before? caroline ng, normal price for plushies? Not really what, Angry Birds plushies only about RM50! khengsiong, I think it defeats the purpose for Firefly to fly from KLIA!